Don’t be sad for me. I’m okay. I love my husband and I plan to marry him again anyway. It’s just that I need another wedding. Because I need another reception. Because I need another wedding cake. Can you really blame me? Wedding cakes have catapulted to a new level of late with more and more couples opting for a unique yet glamorous creation to mark the occasion. 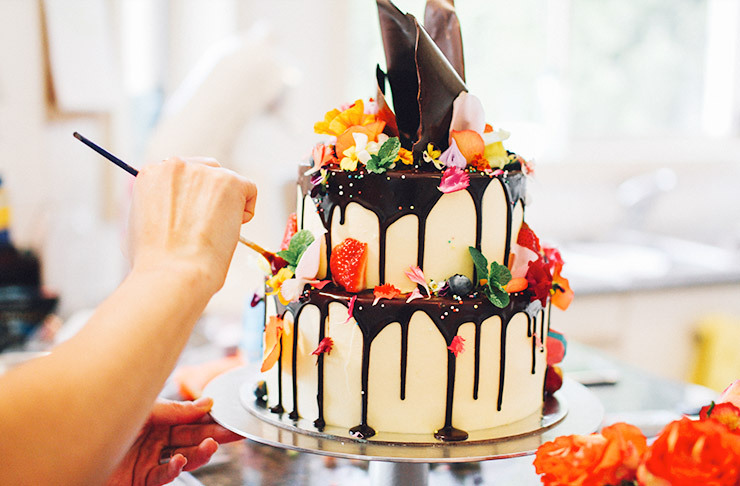 Meet the new generation of wedding cakes in Sydney. There’s an anti-fondant movement gaining momentum and Nikki Lee of Unbirthday Bakery is leading the charge. The Instagram superstar has burst onto the cakery scene in an explosion of edible flowers and colourful buttercreams. A smattering of perfectly-placed adornments such as macarons, chocolate shards, Oreos, popcorn and pretty much any chocolate bar you can think of adds to the appeal of Unbirthday’s signature style. Read our interview with the gorgeous Nikki Lee from Unbirthday Bakery right here. These days many savoury-loving couples turn to cheese for their wedding day dessert fix. Surry Hills’ Formaggi Ocello create beautiful cheese cakes (not to be confused with cheesecakes) to suit each customer’s taste and budget… but good luck making a shortlist. With more than 200 local and international cheeses on offer, you might find yourself with a 56-tier cake before you know it. Don’t worry. I’ll help you eat it. Forget diamonds. Andy Bowdy is this girl’s best friend. Or should that be worst enemy? After all, think of the calories! Like Nikki of Unbirthday, Andy subscribes to the ‘no fondant’ rule. Also, no icing and no buttercream. So how does he moisten* that crumb? Oh, there are ways. Think mousse, fudge, caramel, meringue, cream, peanut butter, passionfruit— the list goes on. Andy creates custom cakes and dessert tables for all your celebratory needs. But you wouldn’t be left wanting with the regular menu which features guys like Jasper, a chocolate fudge cake with Milo mousse, Maltesers and torched meringue. Gimme! A wedding cake adorned with flowers is nothing new although the experts know how to play with the look and feel to ensure designs remain contemporary. Ideally, your cake maker will share the same vision as your florist. Ideally-er (it’s a word! ), your cake maker will be your florist. Enter Blooms by Bethan, your one-stop-shop for cake and floral goodness. Sydney savoury institution, Salt Meats Cheese has come to the wedding party too, creating celebration towers from their mouth-watering selection of Italian, French, Spanish and Australian cheeses. Work with the Salt Meats Cheese team to create your own delicious combo or choose one of the ready-made options, such as the Firenze cheese tower featuring La Tur, Pecorino, Aged Tuscan Pecorino, Vento d’Estate, Brie and Toma Piemontese. The raw food movement is a hit at the moment so it was only a matter of time before the trend infiltrated the wedding scene. Raw-lishious is a Wollongong-based caterer dedicated to creating decedent desserts such as… wait for it—the six-layer Snickers Ice Cream cake featuring a chocolate brownie base and peanut butter caramel. Stop it! All products are raw, vegan and free of refined sugar, dairy and gluten. And, importantly, delish. Paleo and nut-free options are also available. Cliff has a background in architecture—a fact that goes a long way to explaining his monolithic marvels. His bespoke creations are a sight to behold. So eye-catching you won’t want to eat them. Ha! Just kidding. You will definitely want to eat them. They are delicious. Cliff’s ‘design + bake’ process aims to bring your vision to life. His sketch of your concept is an artwork in itself and the finished product will wow wedding guests. Just be careful the cake doesn’t upstage the bride! As an event planning company, Kashaya & Co can do the lot but couture cakes and sweets is where the Double Bay business really shines. Headed up by Kashaya Williams, Kashaya & Co can deliver stunning cakes for the traditional (think white tiers, sugar flowers, lace details) or modern (think naked cakes, donut towers, textured buttercream) wedding. Choose from 11 cake flavours—including salted caramel, almond torte, and coconut and white chocolate, and eight fillings such as dark chocolate, mocha, raspberry and lemon. * Sorry, I know, I know... Worst word ever. Looking for more lust-worthy wedding inspo? Check out these top spots for your engagement or hens party.